Everyone loves ice cream and other frozen treats. It's easy to make delicious, healthy desserts with these recipes. Just in time for ice cream social season, and always great for birthday parties and easy entertaining, these refreshing (and healthy!) recipes will satisfy your sweet tooth. Nothing conjures up childhood nostalgia like these frozen sandwiches—but forget the jangling bells on the ice cream truck and make your own for an even better treat. 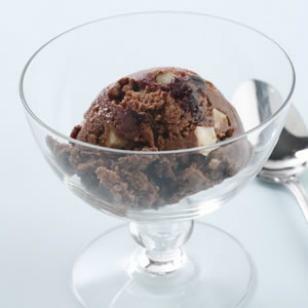 Chunks of white chocolate and cherries make homemade chocolate ice cream even more decadent.